Low cost – low fumes – safe for home use delivering ultra high accuracy and low shrinkage. MP rapid UV resin provides value and consistency in your work. High quality pigments provide stunning colors in our range of resins and available colors (black, white, Gray, clear, yellow, red, green, and Orange). compatible with all UV resin printers (dlp, laser, or LCD), the formula has been optimized for low power LCD resin printers. Cures at 405nm wavelength. 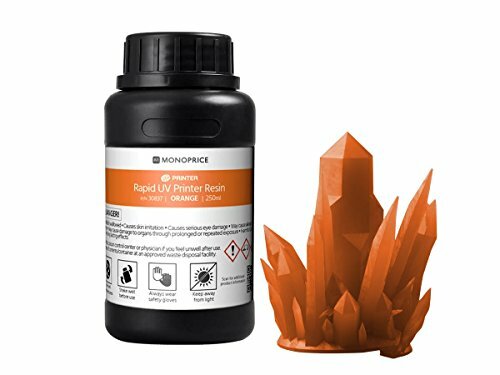 Compatible with all UV resin printers (DLP, Laser, or LCD), the formula has been optimized for low power LCD resin printers. Low Cost/Low Fumes: Safe for home use delivering ultra high accuracy and low shrinkage. MP RapidUV resin provides value and consistency in your work. Service & Support : You're never on your own with Monoprice products! We have a full team of friendly and knowledgeable technicians available to answer your questions, both before and after the sale. View More In 3D Printing Liquid.